After breaking the British indoor long jump record with her 6.97m leap at the European Indoor Championships in Belgrade last month, Lorraine Ugen is targeting the seven-metre mark and a world medal in London. The 25-year-old added European indoor silver to the world indoor bronze she claimed last year in Portland and hopes to gain another global podium place when the IAAF World Championships take place in the UK capital in August. “If you go in there telling yourself ‘I’m a medallist’, then psychologically you’re setting yourself up to believe and achieve that,” she says. “I know that going into the World Championships, if I want to get a medal I’m going to have to get over seven metres. “I’ve been chasing the seven-metre mark for a while now and it’s getting closer and closer. I remember when I was chasing six metres and I wanted to get over that six-metre barrier so much. Once I got over it, it was so easy to keep jumping it. While Ugen was in long jump action in Belgrade, her room-mate Asha Philip was also in British record-breaking form as she clocked 7.06 to gain 60m gold and the long jumper believes that success breeds success. “I think when you see other people performing well and jumping well, it motivates you to think, ‘okay I need to train harder’,” she says. 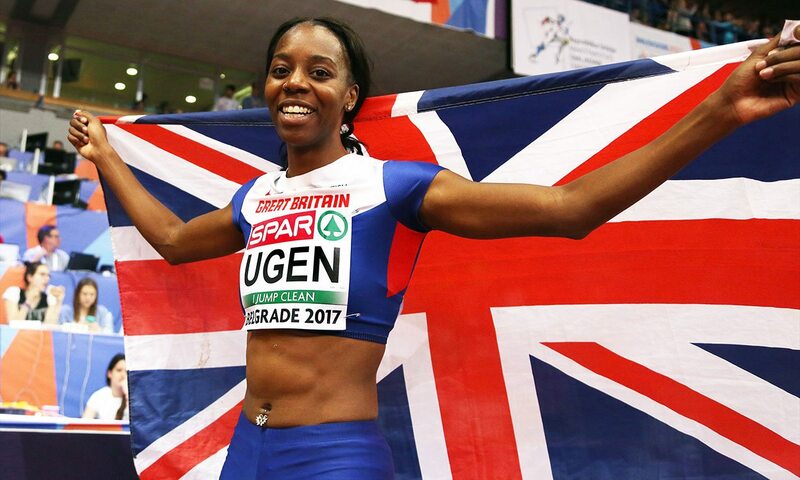 Looking ahead to the London World Championships and the home advantage, Ugen adds: “I remember going to the London Diamond League the year after the Olympics and it was crazy in there.